I've been fighting the good fight to bring you Pinot Noirs under $20, but it's not getting any easier. If you like this delicate, silky grape you are not alone. And if you are struggling to find a wine you like for under $20, well, you're not alone there, either. Here are my favorites among the new fall Pinot Noirs I've tasted thus far. And--miracles do happen--one is actually under $20. And I'm seeing a wide variety of prices for these wines--sometimes they are on sale for far less than the suggested retail. What's going on? 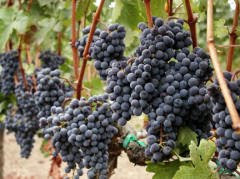 Has the Pinot Noir market softened? Even if the suggested retail seems out of your price league, check your local merchants because you might find one of these bottles for far less than I quote here. Special kudos go to Sean Minor Wines for delivering a Pinot Noir under $20 that can hold its own with more expensive bottlings. Their 2007 Sean Minor Wines Four Bears Pinot Noir ($17; available for $12-$20) is made with grapes from Napa Valley's Carneros AVA. This is a very good, affordable example of a Carneros Pinot Noir. The aromas are full of berry and sour cherry. The flavors are earthy and chalky, with lovely cherry notes held together by the wine's silky texture. The wine has a pleasant, juicy aftertaste with good acidity. Excellent QPR. 2006 Whitehaven Pinot Noir Marlborough ($25; available for $19-$26) I liked the bright cherry and char aromas that were layered with a touch of bacon fact as the wine opened up. The wine's satiny texture enveloped sour cherry, allspice, and meaty flavors. The aftertaste was juicy and peppery, with some roughness to the tannins that should resolve in time. Very good QPR. 2007 Sebastiani Vineyards & Winery Pinot Noir Carneros ($27) Another nice Carneros Pinot Noir for under $30, this one has aromas of brown sugar and cherry. The flavors of cherry, earth, and spicy clove are arranged on a light-bodied, lacy frame. There is a spicy, toasted toasted oak aftertaste that comes as a bit of a surprise, but it somehow works. Good QPR. 2007 MacMurray Ranch Pinot Noir Sonoma Coast ($28; available for $12-$22--and if you get it for $12 you will think it is stupendous in the value department) I admit it. I'm a Sonoma Coast Pinot fan. This is a classic bottling for that region, and affordable, too. The aromas of raspberries, earth, and rocks are what I've come to expect from a good Sonoma Coast Pinot. The flavors were far meatier than the aromas suggested, with berry and cherry fruit, and there was lots of earth and spicy clove in the aftertaste. It tastes just a bit clumsy at present, but I think it will resolve beautifully over the next 6 mos to 3 years, and reward some time and space in your cellar if you can spare it. Very good QPR (unless you get it for under $20, at which point it's excellent QPR). Chardonnay comes in many different styles. Some are light and elegant, other soft and round. There are bold Chardonnays full with striking, ripe flavors and spicy Chardonnays that are just perfect for these early fall days. I've been tasting a lot of Chardonnays lately, and here are some of my favorites from the new releases. No matter which kind of Chardonnay you prefer, I think you'll find one here that fits your taste and your budget--and they all represent very good QPR. Soft: 2007 Bridlewood Estate Winery Chardonnay ($15; available for $11-$16). A small amount of Viognier and other white varieties are blended into this wine, and it shows in the flowery, pear, and golden delicious aromas. The flavors are soft and creamy, like baked apples. Smooth and round, the wine has a juicy aftertaste. 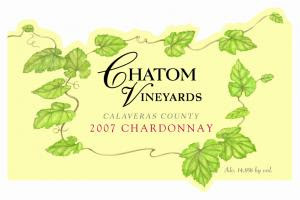 Bold: 2007 Chatom Vineyards Chardonnay ($18; available for $18-$20) A big, bold Chardonnay with aromas of vanilla bean, quince, and pear. The flavors are predominantly apple and pear, too, and there are herbs and cream on the tangy finish. Round and full in the mouth and 14.9% alc/vol. Elegant: 2008 Sebastiani Vineyards & Winery Chardonnay Unoaked Russian River Valley ($18) This lovely bottle of wine has a very restrained style. I enjoyed the faint aromas of pear, mineral, and salt, as well as the light, fresh lemon and pear flavors. The finish is crisp, juicy, and clean. Spicy: 2008 Bodega Catena Zapata Chardonnay Alamos ($13; available for under $9) A spicy chardonnay, with aromas of fall baking: apple, allspice, and nutmeg. The wine is lush and spicy in the mouth, too, with citrus and apple notes and a spicy vanilla aftertaste. I'm sliding in a weekend post--a recommendation for bargain bubbles in case you have something to celebrate. When a wine is this enjoyable and this affordable, I figure finding a reason to celebrate is pretty easy. Did you finish your laundry? Clean out the TiVO? Wash dishes? If so, treat yourself to a bottle of the NV Zonin Prosecco (suggested retail around $14, but available for $8-$18 in the market). This is a new bottling for Zonin, which already makes a popular "Special Cuvee" and "Brut" Prosecco. I really enjoyed this wine in part because it was a hair off-dry, which made for a wine that tasted soft with aromas and flavors of honeyed apple. There are some zngy tangerine peel notes in the aftertaste, which only added to the attractions for me. This was a nicely-priced, thoroughly enjoyable, not-too-serious sipper of a Prosecco that you can enjoy before dinner or with dessert without guilt or stress. Very good QPR all around. When one of your favorite online retailers opens up a bricks-and-mortar outfit in the town where you live, it's cause for celebration. domaine547, which has been my regular source for unusual--and affordable--bottles of wine has opened the doors of domaineLA. On chic Melrose Avenue, in one of LA's ubiquitous strip malls, is a new wine store that offers way more than the bottles of wine you see in every other urban wine emporium. The palate behind the store's selection is Jill Bernheimer, who has been blogging, twittering, and selling wine online for a while now. I like Jill's palate, and trust her recommendations--so much so that she's really the only person I buy sparkling wine from any more, whether its affordable Cava or splurge-worthy Champagne. And I appreciate her efforts to go beyond the normal Cabernet/Chardonnay shuffle and stock wines made from grapes like Poulsard and Assyrtico. 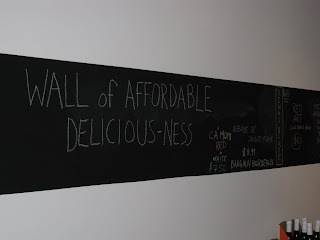 domaineLA is a cool space, with fantastic post-modern grape lighting, a central seating area that feels like a lounge with wine books to leaf through, and a running strip of chalkboard where Jill posts messages and recommendations. 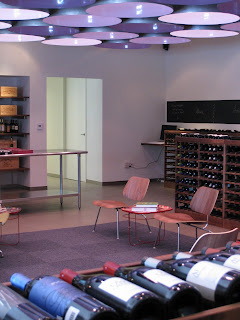 There's even a computer in the corner where you can check out wine ratings ("if you must," Jill says). I bought a case of wine while I was there. As always, I appreciated the time and the good advice that Jill gave me based on what I was looking for and what she knew I'd liked previously. This is the kind of relationship that everyone hopes they can have with a retailer--and all I can say is it really makes a difference. So what did I buy? I indulged in a 2005 Stéphane Tissot Poulsard Arbois Sans Soufre ($26), a and a N.V. Chartogne-Taillet Champagne Cuvée St. Anne ($45). I got great deals on a 2008 Trajarinho Vinho Verde from the "Wall of Affordable Delicousness" ($9.99), the 2008 Masia del Bielsa Garnacha Campo de Borja Viñas Viejas ($10), and the Charles Syrah Volume II Talcott Vineyard ($10). And I walked on the wild side with a 2008 Mercouri Estate Kallisto ($19.99), a dry 2007 Viñedos de Ithaca Priorat Odysseus Pedro Ximénez ($20), and the 2008 Ludwig Winery Gewürztraminer Dry Single Vineyard Selection ($13.50). Anybody out there had a dry PX before? Me neither! If you are in LA, check out this great new store. It's worth the trip to replenish your stash of exciting, drinkable wines. I'm finishing up with my whirlwind tour of Ligurian wine as part of my ongoing trawl through Italy's wine regions and grape varieties. Even though I spent more than $20 on this wine ($25.99, to be precise), I'm still pretty pleased with the very good QPR on the 2005 Azienda Agricola Durin Ormeasco di Pornassio. ($25.99, Wine Expo--and I can't seem to find it anywhere else!) This is a classy, distinctive wine that offers up lots of character for the price. Ormeasco is Ligurian for Dolcetto, I discovered, and one of the things I like best about the grape is that it's a wine that is just as good with pizza and spaghetti with meatballs as it is with grilled beef, roasts, and more elegant fare. It's a dress-me-up, dress-me-down kind of wine. This was a really lovely example of what Dolcetto/Ormeasco is all about. First, Dolcetto is a treat for the nose. There were aromas of licorice (which I love and it can be hard to find in a wine), cherry, fresh green fennel, and blackberry that you had to coax out of the glass at first, but which were worth the wait. I found echoes of all these notes in the flavors, with additional grilled herb nuances emerging in the aftertaste. There are cheaper Dolcettos out there, but they are far simpler than this wine turned out to be. This wine would be fantastic with dishes that involve rosemary or fennel (to pick up the herbal notes), with meats (chicken, duck, and beef), and with anything that is Mediterranean in its culinary influences. One wine stands out to me as a real friend to all these vegetables: Pinot Grigio. This week on Serious Grape, my column on Serious Eats, I share my recommendations for some of the best new Pinot Grigios in the market. 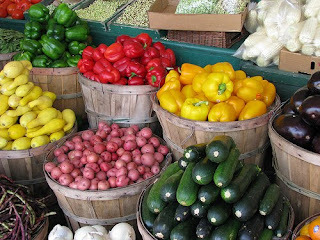 They come from all over the world--Italy, France, Calfornia, and Australia--and though each one has a distinct style they share common characteristics like good acidity that make them a perfect partner for vegetables. Head over and check out my list of Pinot Grigio suggestions and be sure to add your own if you think I've missed one. A colorful tomato salad and a glass of Pinot Grigio is one of September's great treats, so head to your local farmers' market this weekend and then to the wine store. 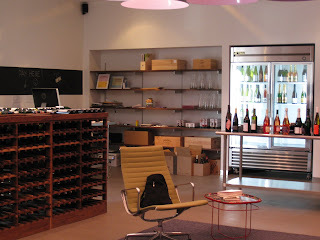 Welcome to Wine Blogging Wednesday, the online tasting event dreamed up five (!) years ago by Lenn Thompson of Lenndevours: the New York Cork Report. This month our host is our founder, and Lenn's theme for this month's tasting was "At the Source." Our instructions were to "actually visit a winery and taste a wine there. Bonus points if you can taste it with the winemaker or the vineyard manager." I'm getting some major bonus points on this one because I tasted wine with the winemaker, the vineyard manager, the farm manager, and the owners! As the slideshow above illustrates, they raise pigs, fruit, bees, chickens, vegetables for area restaurants and grocery stores, and fruit at Quivira. They've also restored a stream for Steelheads hoping to bring them back to the Dry Creek Valley where they once flourished. And yes, they make great wine, too. If you are interested in experiencing all Quivira has to offer, consider attending one of their farm-to-table seasonal dinners. 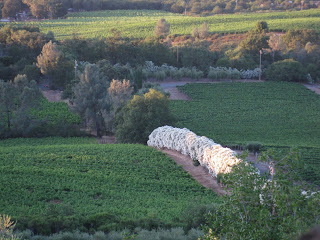 The next one is on October 10 and will focus on the restoration of the creek, a fabulous dinner, and excellent wine. There will be a winter dinner in February that will include a hands-on blending seminar, and a spring dinner featuring a discussion of biodynamics. You can see menus, check out the dates, and reserve your place at dinner by clicking here. Last week, Palate Press--an online wine magazine--was launched. Hit by the double whammy of houseguests and a new academic term, the launch came and went without me commenting on it, but I wanted to take a minute to recommend the new venture to GWU$20 readers. First, a disclaimer. I became involved in the project in its early stages, and have the role of "wine review editor." We hope to roll out the wine reviews next month, but until then I'm just a reader like you are--and I'm liking what I'm reading. The reason is simple: there's an editor. W. R. Tish, who was the editor of Wine Enthusiast magazine for ten years. Let's face it, the great thing about blogs is that there's no editor. The bad thing about blogs is that there's no editor--and everyone (and I do mean everyone) needs an editor. Editors do more than find typos and grammatical errors. They keep an eye out for balance, they make sure that there's a coherence to the stories being presented, they make sure that the content is varied, and they ensure that the writing is focused and sharp. Editors need writers as much as writers need editors, of course. Publisher David Honig (you might know him from the 2 Days Per Bottle blog) and editor W. R. Tish (of Wine Skewer) have recruited some of the most dynamic wine bloggers to participate in the project. These wine bloggers are contributing their enthusiasm and expertise in articles that cover a wide range of topics of interest to readers like you. In the first issue, Andrew Barrow wrote a terrific piece on the food and wine of Alsace, Meg Houston Maker reviews Randall Grahm's forthcoming book, Been Doon So Long, Robert Dwyer examined common shelf-talker practices to determine whether they deceive consumers, Thea Dwelle explored the quintessential "American" grape Zinfandel, and Sonadora explored the social networking efforts of Twisted Oak Winery--and tastes some wine while she's at it. And, because there's always room for some pot-stirring, Arthur Z. Przebinda took on the nature of wine criticism itself. I'm already looking forward to this week's stories on tasting groups, wine labeling, Walla Walla wine, brettanomyces, and more. So head over to Palate Press and check it out if you haven't done so already. Who knows where this experiment will lead, but right now it's already delivering excellent QPR. There are many, many styles of sparkling wine out there to bewitch and delight us. Some are light and graceful sparklers that remind me of ballerinas dancing Swan Lake in foamy tutus. Some are fizzy, dry sparklers that remind me of a worldly jazz musician playing the piano. And some are rich, zaftig sparklers that remind me of an opera diva in a velvet gown hitting a high note. This wine falls into the final category. It is rich, robust, zaftig, complex--just like a diva should be. And it costs just under $20, which makes it excellent QPR. 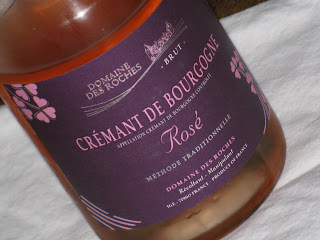 Don't let the pale salmon color of the NV Domaine des Roches Crémant de Bourgogne fool you. ($19.99, domaineLA; available elsewhere for $15-$23). Or the faint aromas of mineral, dough, and strawberries. Focus instead on the very active bead and the full-bodied, dry flavors of strawberry and toast. This is well worth the $20, and unusually sophisticated for a Crémant de Bourgogne. I know it was just Labor Day, but if you still feel like you need a mini-break in the tropics in order to get through the fall, look no further than the Santa Ynez Valley and the 2008 Firestone Vineyard Sauvignon Blanc. (suggested retail $11-13; in a market near you for $10-$18). This was one of the more exciting Sauvignon Blancs I've had this summer. It's made very much in the style of New Zealand Sauvignon Blanc, without the influence of wood. This zesty, tropical fruit inflected wine had aromas of lemongrass, starfruit, pink grapefruit, and lime. Layers of round, tropical fruit flavors were accented with the same citrusy grapefruit and lime notes that I detected in the aromas, and the wine has a fresh, grassy finish. Excellent QPR if you can find this wine for $15 or less, and no matter what the price you will consider it to be a good buy if you've always reached for New Zealand bottlings in the wine store but have been shocked at their rapidly rising prices. If you're looking for a recipe to pair with this wine, try it with this yummy Green Goddess Chicken Salad. This fast and simple one-dish meal uses a bought roasted chicken to speed preparation, includes cubes of bread, and makes the most of late summer herbs. The wine really accentuated the herbal notes in the dressing, and the roundness of the tropical fruit flavors were lovely with the chicken. But they're worth the search. 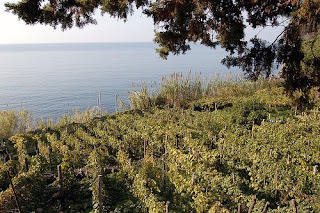 Ligurian winemakers not only make stunning Vermentinos--perhaps the best known of the region's grapes--they also grow less traveled grapes like Albarola, Pigato, and Rossesse. They also have their own names for grapes such as Dolcetto, which the Ligurians call Ormeasco. 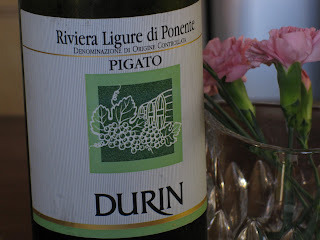 So sip along with me this month as I sample a red and a white wine from Liguria. 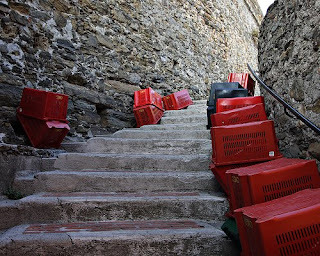 As always, if you've had some good Ligurian wine you can recommend, please leave those suggestions in the comments below. Wishing everybody a restful and relaxing break from all your labors. This week on Serious Grape, my weeky column on Serious Eats, I suggest a few wines for your consideration. 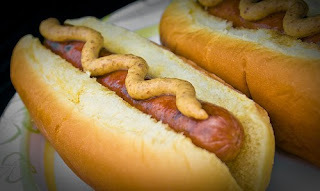 The thing about hot dogs is that they are both sweet and salty--and then a variety of sweet and savory condiments get piled on top. Head over and check out my hot dog wines and if you have any other suggestions, leave them here or there in the comments section. In a recent post I highlighted the value represented by wines from Alsace. While most associate Alsatian wines with still Rieslings and Gewürztraminers, Alsace also makes terrific sparkling wines that can stand up to any rival in terms of taste, elegance, and price. My latest recommendation in sparkling wine from Alsace is the very good QPR N.V. Lucien Albrecht Crémant d'Alsace Blanc de Blancs Brut (suggested retail $19.99; available in the market for $12-$23). Crafted from Pinot Blanc grapes, this sparkling wine had abundant yeasty, bread dough aromas. I liked the fine, lively bead and the light, effervescent foam that topped my glass. Both hinted at the delicacy of the flavors to come. When I tasted the wine I detected elegant pear, citrus, and brioche flavors. An affordable sparkling wine like this one doesn't need to be saved for a special occasion. It would be excellent with potato chips before dinner, with some fried chicken or seafood for the main meal, or even with a fruity dessert.